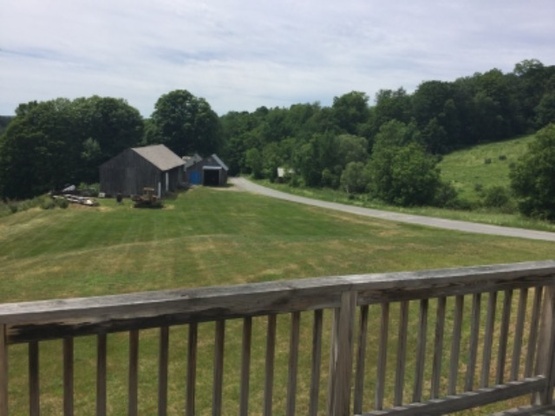 Country setting, close to interstate 91 and 89. Our area is completely open and you can definitely see the night sky. We have deer, turkey and woodchucks running around. You can walk up and down the road or sit in a chair and enjoy the peace and quiet. Grassy open field on deadend road. Only five houses on this road. Close to town but out of the way. View of surrounding hills, some wildlife from time to time. Quiet most of the time may hear traffic from a near by road. Yes. We have a bit of open area to park. It is hard to describe but more than spacious. You can park next to your rig. Someone is usually always around from May to Dec. If we are not our son is and that is never a problem. We encourage people to come for foliage season but we never really know when that is. The weather changes that around a lot. So you never know whatmght happen. Just give us a shout and we will see what’s up. We have many small towns around our area. Fun to visit and look around in. We encourage people, if they can, to lock up and go for a drive. We are here 99% of the time and no one bothers us here. Did not get to meet the host, but their son, daughter in law and grandsons were there to meet us. Very friendly, we received some maple syrup (yummy!) & they also allowed us to get some water for the road. Thanks so very much - Happy Easter! Nice place and Amazing hosts ! Such an amazing experience at Just a dubbin Farm!!! It was our 1st boondocking and we met some issues with our RV. Hosts were so helpful and generous, taking time and helping us to fix the issues. We are so blessed to stop at this nice place! We had the opportunity to boondock once again with Just A Dubbin and were very happy with the accommodations. Quiet and peaceful out in the country. Spent time looking for wildlife and did have a visit from 17 turkeys. Met with the family and had a great visit. We had a nice and peaceful night at the farm. The kids had a grand time running in the big green grassy field and even though the hosts were out of town their son and daughter-in-law met us there. They were so welcoming and helpful. This was our first Boondockers Welcome stay and it was really nice. They even had some maple syrup for us as a gift! What a treat! We visited the apple orchard just up the road at the hosts recommendation and it was perfect for us. We got some delicious apples and thoroughly enjoyed the petting Zoo. Loved being in the field. Very quiet and peaceful location with very friendly hosts. ... with very nice people ! Ruth and Ray are very welcoming. We contact us late and they accept us directly in a very beautiful place. When another host rescinded their offer, dubbing made arrangements for their son to meet us since they were out of town. Unfortunately we couldn't make it. They were very gracious again when I didn't tell them we weren't coming. Special people. Stayed over night so I could go to the "Balloon festival " in Quechee, vt. Not only did my host take me to the store but gave me some REALLY maple syrup! Unfortunately for me the festival was rained out,but the trip was worth it.Linda and Rusty and are roadtrek. We love Ray and Ruth! Ray and Ruth were so welcoming and thoughtful. We really enjoyed some great conversation, learned so much about them and their lovely family, and felt right at home. They were incredibly welcoming to our kids, too, and we LOVED the maple syrup. YUM! They put us in a great level spot on gravel with electricity, and we all slept like babies. This was one of the quietest spots we've stayed in and very restful. We just had the opportunity to stay with Ray and Ruth and they were great. Very friendly and most accommodating. Very nice flat open parking space. No problem at all with 40' and toad. Being in Vermont during the fall was a bonus. Highly recommended. Great Couple - Great Site! We really enjoyed our stay with Just-A-Dubbin. A nice quiet, level and grassy site. Very interesting, generous and fun to be with couple! Amazing stars and moon the night we stayed. A definite thumbs up!